As of last night, the Marfa stonehouse fire had taken into the town of Fort Davis, several structures were lost, the fire had breached the state park as of last reports last night. I know it has headed up to Balmorrhea and there were worries it would make it to Ft. Stockton but until our limited news resources recover from last nights coverage we have no updates. We do know that the Fort Davis area has been deeply affected. If you have any plans to visit there in the next week, I'd call them off. After that, you'll want to call ahead and see what the conditions are in the town. In the meantime, your prayers, well wishes, and whatever else you can spare are welcome. "The word Praise does not feel strong enough. The word Gratitude does not feel strong enough. But our thanks go out to the firefighters, volunteers and everyone helping with the fight against wildfires in our region. There have been many losses, but also SO much has survived, thanks to you." The fire missed the Fort, the downtown, and the Observatory. They need your tourist dollars. Yes, come! Most places are still operating, Prude Ranch was in full swing yesterday and the town of Fort Davis is holding an Easter Egg hunt on Easter with the price of admission being a nonperishable food item! 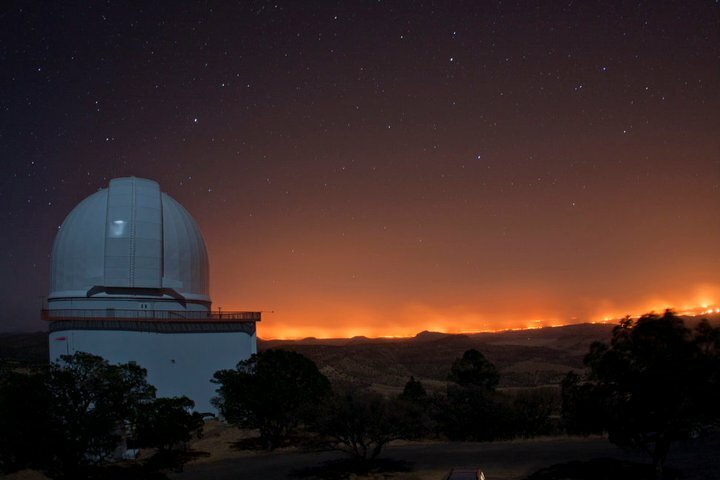 Due to wildfire conditions in the area, the McDonald Observatory, including the Visitors Center, will be CLOSED to the public through at least Monday, April 18. If you have reservations for programs during this time, refunds will be processed as soon as possible when we re-open. Status updates will be posted on Facebook." Beautiful in its way. We have to look to the positive in this too. Eventually this will help the entire area. this first one links to a forest Service site where you will find at the bottom right on the page a CONUS KMZ file that you will need Google Earth loaded on your computer to display the data. It shows the active fires in the US and Mexico and is updated daily. 6mph - wow, can't out run it for sure - hate to be backpacking/camping in the area and see that! Imagine being on the OML, up in the high Chisos, or the Window trail and seeing that! thanks Shanea, you do a terrific job! Did y'all see this one from Big Bend Stuff? I'll title this one "smoke signals"
As horrible as they are, we can at least be thankful that the flames have not reached McDonald Observatory--at least not yet.